"All Tens have Aces in their hand which denote ambition and a willingness to be a pioneer in certain respects. 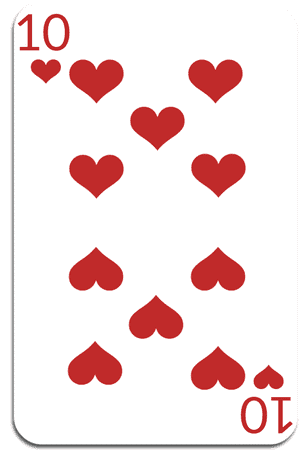 This Ten has the Ace of Hearts, which represents babies. Ten of Hearts make others feel secure and grounded, but this also means that they strive to feel safe and secure themselves. They have an underlying feeling of..."
Ready to get the Personality Report? WTF is this all about? Go here. Want to go all in? Get your PRC's Kit! WTF is in the Kit? Go here.